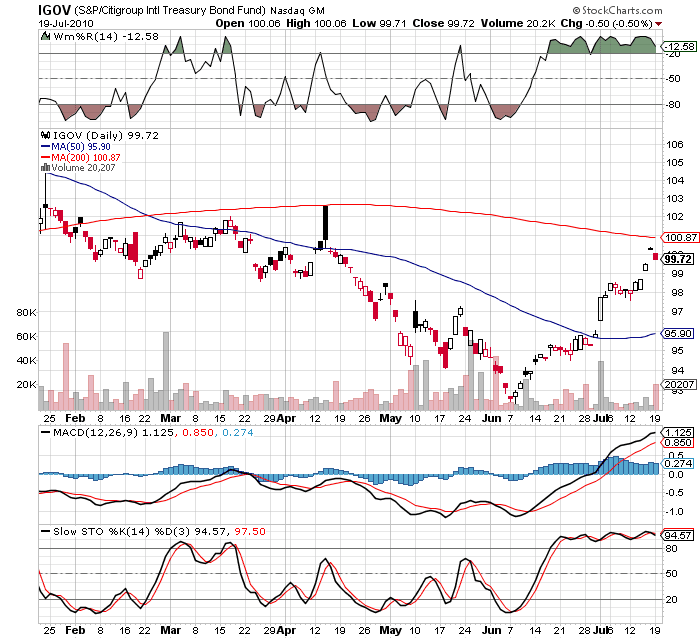 Bond ETF reversal alert -- but will the rally continue? This weekend's Reversal Alerts based on weekly data turned up an interesting BUY signal for an ETF I had never heard of before. 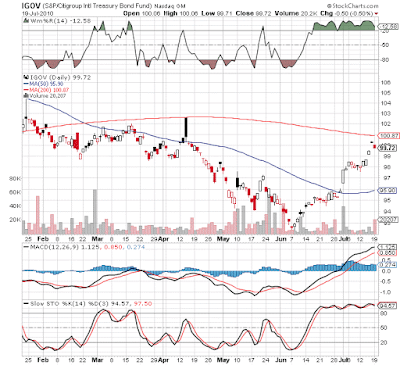 The symbol is IGOV and the ETF is the iShares S&P/Citigroup International Treasury Bond Fund. The S&P/Citigroup International Treasury Bond Index ex-US is a market value-weighted index designed to measure the performance of treasury bonds issued in local currencies by developed market countries outside the U.S.
Holdings include bonds from Japan (fully 25% of the fund), France, Italy, Germany, Austria, Canada, Australia and even the problem children like Greece, Ireland, Spain and Portugal. Credit ratings are mostly in the AA to AAA range. Maturities are mostly short to intermediate with roughly 75% of holdings falling into the 1 to 10 year maturity range. This chart suggests that investors have become much more comfortable holding sovereign debt lately. As stocks have fallen out of favor, bonds have received attention and IGOV seems to be benefiting from this rotation out of equities. A technical analyst, however, might point out that on this daily chart the ETF appears over-bought according to Williams %R and Slow Stochastics. In addition, strong resistance looms above at the 200-day moving average. A move through that 200-DMA would signal a continuation in the new bullish trend. The fact that IGOV doesn't look nearly as over-bought on the weekly chart and that it has moved above resistance in the $99 range are also positives. Given that Europe seems to be emerging from its sovereign debt crisis (Greece and Spain have been able to issue bonds at better than expected rates, confirming investors are developing some optimism on the countries sorting out their problems), perhaps IGOV really does have the potential to keep up the bull run. And compared to similar ETFs it even has a rather low 0.35% expense ratio. If you are looking for an international bond fund that is not focused on emerging markets then IGOV might be the right ETF for you.